Extreme cliff diving is easily the most dangerous “adrenaline” sport in the world- and it also happens to be the least complicated. Unlike skydiving or snowboarding, you don’t need any equipment to throw yourself off of a 90-foot cliff! You don’t need any fancy clothing either – a pair of shorts will probably do. Finally, you don’t have to spend tons of money on lessons- you just do it. You don’t need to be a rocket science to understand this. You jump and you land in the water. 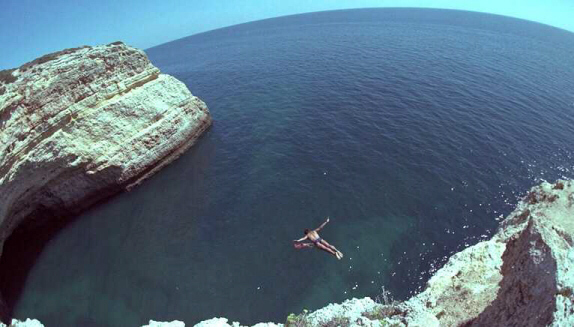 However, don’t be fooled into thinking that cliff diving is “safe”. There is plenty of danger involved in this sport and properly educating yourself before jumping can save your life. Even the world’s best divers make mistakes and injure themselves. 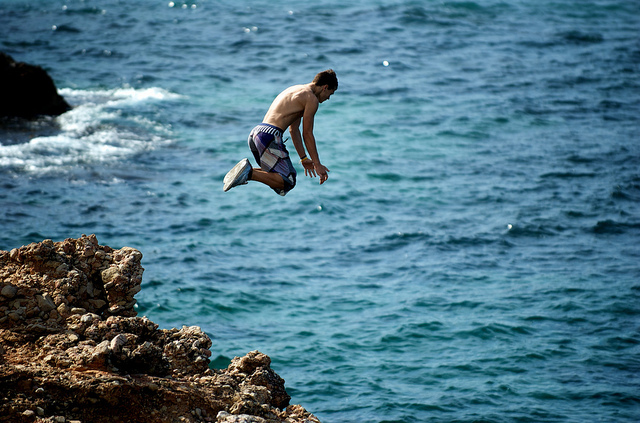 Cliff diving began way back in the early 1770′s. It was during this time that English explorers witnessed indigenous people jumping off of cliffs in what is today known as Hawaii. It was later discovered that the leader of these people was King Kahekili (that last king of the Maui). He threw himself from the 63-foot Kaunolu cliff and entered the water without making a splash. He later became known as the “bird man”. He later forced his warriors jump off of these cliffs to prove their bravery and loyalty. It was also believed that the Mayans loved cliff diving as well. One of the more known spots, La Quebrada, was where they would do most of their jumps and it is still a popular tourist attraction today. As you can see, cliff diving has been around long before you or I have. 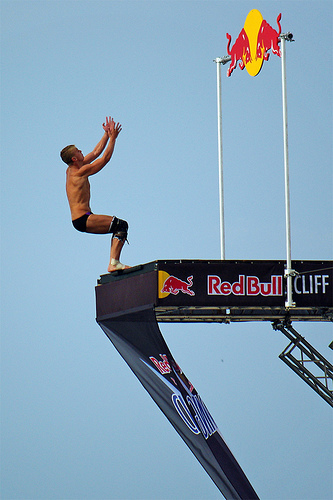 Today, extreme cliff diving is organized by the World High Diving Federation (WHDF). They are the ones who sanction annual events and host world championships every year – they also are the ones who established a qualification and judging system for the sport (very similar to the layout of the Olympics). Their headquarters are located in Switzerland. Before any diver learns the advanced techniques, he or she must learn the basics. Basically, the easiest trick to master in extreme cliff diving involves an entry head first into the water. At first this may sound like it would hurt; be aware that it can if you don’t do it correctly. Be sure to extend your arms and clasp your palms tightly together (this helps protect your face). As your arms enter the water, a stream of bubbles is created and surrounds your body during the dive. This lessens the amount of force that the water has on your body. Are you looking for some high cliffs to jump off of? If so, you are in luck because these are the highest and most dangerous in the world. Beware: you might want to leave these to the professionals. This is where the major cliff diving tournaments are held every year. 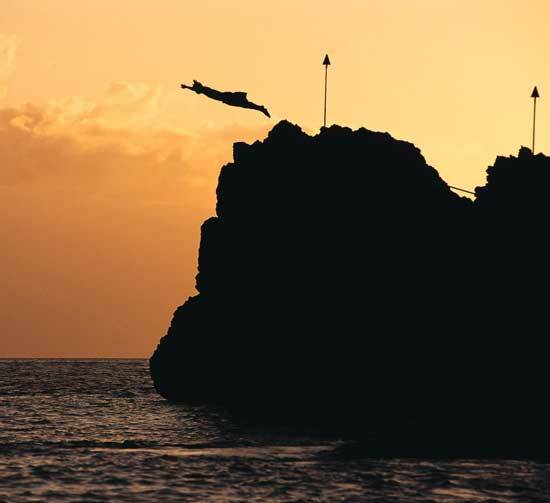 If you come during the right time, you can witness a group of performers known as the “Quaberada Cliff Divers”. They perform death-defying stunts off of this 60+ foot ledge. This 100+ cliff is the home of the Wolfagangsee Cliff Diving Championships held once a year. This is where the European World Championships are held every year. Note this is a very dangerous spot and should be left to the pros. The view from up here is the beautiful. However, this 80-foot drop can be dangerous. Supervision: The WHDF recommends that you shouldn’t jump from heights of 20 meters or more unless you are being supervised by trained and certified scuba divers. Debris: Always make sure there is nothing under you before jumping. Especially in choppy water, things like branches and other light debris can float just under the surface and can seriously injure you if you land on them. Start slow: Don’t start with the highest cliff you can find. You don’t need to hurry, they will be there for a long time I’m sure. I would recommend jumping from high dives into swimming pools until you feel comfortable. Practice doing perfect pencil dives without making any splashes. As you gain more experience, you can move up in height. Buddy system: Never cliff-dive alone. If you do, then there is a chance that you might hurt yourself and nobody will be there to help you. Check it out first: If possible, swim around the landing zone to make sure that there isn’t any debris lying around (and too make sure that it is deep enough). Feel around for roots, rocks, or anything else that could potentially hurt you. Dress right: To get the most out of a jump, wear a wet suit. This helps you glide through the water when landing and should create less of an impact on your body. Also, don’t wear shoes- this creates unwanted resistance that could cause you to break an ankle. Keep it simple: You main objective should be to land in the water and live to tell about it. Avoid doing crazy tricks and stunts…leave that to the professionals. I am going to leave with you with one final note: Always have an exit planned. You have no idea how many people jump off of cliffs and then emerge from the water and realize there is nowhere to climb back up. It sounds funny but many people have drowned this way, so always keep a close eye for an exit! Above all, have fun. Extreme cliff diving isn’t supposed to be all work and no play. Stay alert and don’t forget to enjoy yourself! This entry was posted in Cliff Diving, Europe, South America, Travel, United States, Vermont, Water Sports and tagged Austria, Cliff Diving, Mexico, Switzerland, Vermont. Bookmark the permalink.